Good news this morning. The street here in Copenhagen - Nørrebrogade - that has been closed off to cars for a trial period of three months will now enjoy a permanent status. "Our goal of transforming Nørrebrogade into a better place to be, making it easier to be a cyclist, pedestrian and bus passenger, has succeeded", said Klaus Bondam, the councillor in charge of Traffic and Environment. "Even among those who choose to drive there is a majority for making the initiative permanent", he added. We've covered this exciting development in previous posts. See the link list at the bottom. 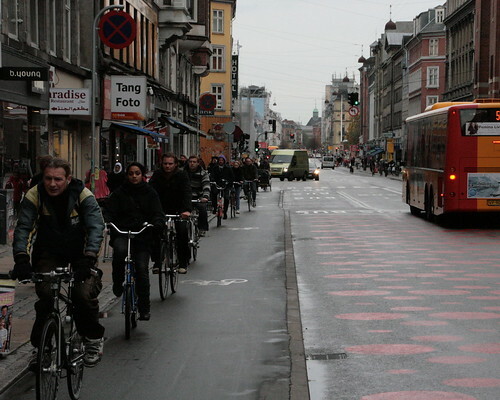 In summary, Nørrebrogade [North Bridge Street] is a main artery leading into the city. It slices through a neighbourhood where only 30-40% own cars so the traffic isn't local. The street has always had problems flourishing, despite the fact that 75,000 people travel down it each day. It is the busiest bike street in the nation with 35,000 bikes a day. In addition, 65,000 bus passengers are transported down the street. Roughly 15,000 cars was the average. The street was closed off to through traffic for a three month period. Busses and bicycles are allowed to use it but cars are diverted onto other streets. The street is also the home of the first Green Wave for cyclists. The traffic lights are coordinated so that cyclists can ride 20 km/h and hit green all the way into the city. So. With all that said. The closing of Nørrebrogade is now to be permanent. The trial period has been a roaring success. 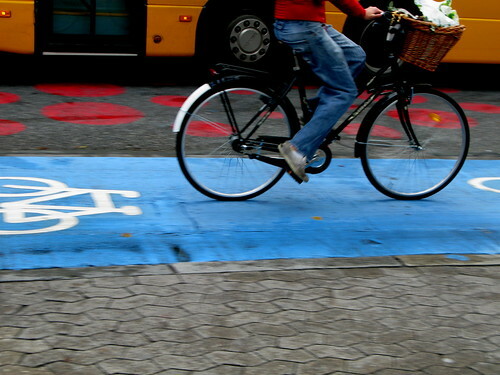 - In November there was an increase of 15% in the number of cyclists. - Car traffic has fallen by an average of 40% during rush hour. It varies along the stretch, from 30% at the far end to 80% in the heart of the neighbourhood. - Traffic on some of the side streets has fallen dramatically and risen in other places. - On the two main approach arteries into the city that bookend the neighbourhood - Åboulevarden and Tagensvej - there has been a modest increase of 10% in car traffic. These two streets are actually designed for cars and can easily handle this increase. - Busses enjoy a higher mobility level now. They can stick to their schedules along the entire stretch. Most importantly, the majority of residents in this neighbourhood love the initative. 67% support keeping the street closed to cars. 24% are against and 9% don't know. There is a flipside to the coin. Along certain stretches there is a no-stopping zone and trucks with goods are sent to loading zones on side streets. Unfortunately there are often cars parked in the spots. It's a behavourial issue, which will certainly be ironed out. It's only been three months. There have been protests from local businesses. 61% of them in the area are against the permanent plan and 25% are for. The nay-sayers claim that business will be affected. This is rather silly. We have heard the same crap before in Copenhagen, starting back in the 1960's when streets were pedestrianized. Predictions of a commercial doomsday proved to be wrong. This is much the same as in other cities around the world. Creating more liveable spaces and improving quality of life/reducing noise and pollution has always served to increase business. Half the businesses say that sales are down on the street. Funny how they blame the traffic initiative when in fact there are two reasons for it. The global financial meltdown is a main reason but there has also been a spate of gang shootings in the neighbourhood, which has caused people to stay away. All the more reason to improve the street and make the neighbourhood more attractive. As we've mentioned before, it's important to remember that cyclists make better shoppers than motorists. Sources: DR, Politiken, excited text messages from friends.